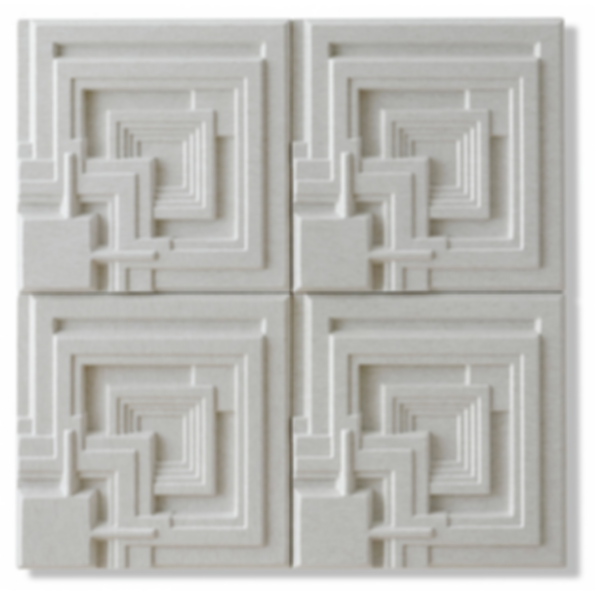 Frank Lloyd Wright's mesmerising pattern for the concrete blocks used to build the Ennis House, the last remaining textile block house, has served as futuristic backdrop in movies and made an imprint in history books. Now, the Ennis pattern has been applied on Soundwave©, Offecct's trademark acoustic panels made of recyclable moulded polyester, and will be used to improve the sound environments in past, present and future architecture. Ennis is a lightweight sound absorber in the upper frequency range (500 Hz and above). These panels help reduce disturbing reflections of environmental noise such as voices, telephones etc. Recyclable molded polyester fiber in offwhite.